Initialized by Youth Union of Hanoi National University of Education in 2011, after 6 times held by Hanoi National University of Education, Hue Pedagogical University, The University of Da Nang - University of Education, Hai Phong University, Hanoi Pedagogical University 2, Ho Chi Minh City University of Education, the conference was held once more time by Hanoi National University of Education in 2018. The conference took place at K1 Hall of HNUE on October 25th 2018. Its purpose was to publicize the new research results of young academic staff of the pedagogical universities, contribute to the beginning of the valuable research, and facilitate young cadres from many different fields of research to exchange and collaborate with each other. The conference was attended by the leaders of the local pedagogical universities: Assoc. Prof. Dr. Nguyen Thi Hien – the president of Hai Phong University, Assoc. Prof. Dr. Nguyen Dinh Luyen – Vice president of Hue Pedagogical University, Assoc. Prof. Dr. Vo Van Minh - Vice president of University of Education - The University of Da Nang, Assoc. Prof. Dr. Mai Xuan Truong - Vice president of Thai Nguyen University of Education, Assoc. Prof. Dr. Nguyen Tien Cong – Vice secretary of Vietnamese Communist Party Committee of Ho Chi Minh city University of Education, Assoc. Prof. Dr. Le Viet Dung - Vice president of Can Tho University, Dr. Vu Thi Phuong Anh - Vice president of Quang Nam University, Prof. Dr. Dang Van Soa - Vice president of Hanoi Metropolitan University, Assoc. Prof. Dr. Nguyen Dinh Hien - Vice president of Quy Nhon University, Assoc. Prof. Dr. Le Van Cuong - Vice president of Binh Duong University, Assoc. Prof. Dr. Nguyen Thi Phuong Thao - Vice president of National University of Art Education, Dr. Phan Thi Tinh - Vice president of Hung Vuong University, Dr. Dang Quyet Thang - Vice president of Nam Dinh University of Technology Education, Dr. Nguyen Duy Quyet – the president of Hanoi University of Physical Education and Sports along with Head, Deputy head of the offices and the secretary of Youth Union of the universities. On behalf of Central Youth Union, Hanoi Youth Union, there was Mr. Chu Hong Minh – member of Central Committee of Youth Union, Vice Secretary of Hanoi Youth Union and the President of Hanoi Student Union. On behalf of Hanoi National University of Education, there were Prof. Dr. Nguyen Van Minh – the president of the university, Assoc. Prof. Dr. Nguyen Van Trao - Vice president of the university, Dr. Nguyen Van Thoa – Secretary of Youth Union of the university, the leaders of faculties, offices of the university, the Committee of Youth Union of the university, Secretary of the Youth Union branch, young cadres, and members of Youth Union of the University. Besides, there were the writers of the reports at the conference who came from the pedagogical universities of Vietnam and the reporters of the website of Central Youth Union, Education and Times newspaper. The conference received over 149 reports of youth cadres from over 20 universities having pedagogical field in Vietnam. The qualified reports after the counter-argument process were posted in the summary record of the conference – HNUE publishing house. In the opening presentation, Prof. Dr. Nguyen Van Minh – the president of HNUE emphasized on the achievement of young cadres: “The noteworthy point last year was the contribution of young cadres of Vietnam pedagogical universities in the report of the top magazines in the world. It proves that young cadres of Vietnam pedagogical universities have the ability to do research not only in educational science but also in other fields and reach the international qualification. First, “ the study begins with small topics, which is taken for granted when we start conducting a research. However, we need to think the problems comprehensively and solve each module in order to create significant research, not to be submerged in the details. Second, “Research is inseparable from reality. There is always a gap between research and practice, which is not invariant. We should be smart enough to bridge that gap. There are studies to be applied soon, studies to pave the way for application and studies to enlighten in thinking and establish the foundation for ideological, worldly and ecological breakthroughs. or become the beginning of new problems. " Prof. Dr. Nguyen Van Minh expected that young researchers – cadres of the pedagogical universities would have "the insatiable desire", "the iron will". This is "the important prerequisite for conducting research." This year's conference, entitled "Young People with Innovative Education and Revolution 4.0", attracted the participation of young cadres of pedagogical universities and some universities with pedagogical field  nationwide. This shows the attractiveness and scientific quality of the conference. + Natural science and technology: Concentrating on applied fields such as researching to improve quantum dot solar energy efficiency, optimizing laboratory conditions to accelerate the birth process of zebra danio, using atomic absorption spectrophotometry to determine zinc content in leaves, biodiversity and factors affecting biodiversity, methodological studies, and applications of software in natural science research, etc. + Social science and humanity: The reports show the trend of interdisciplinary comparative studies (literature - cinema - history - geography - culture), comparison between countries (Vietnam - India - Myanmar - Singapore - USA), comparison among the periods, emphasis on the problem of preserving and transforming the culture and society in line with the new age, in the new perspective. + Educational science: The reports focused on the topic of education in the context of the industrial revolution 4.0, which was illustrated by studying the effects of industrial revolution on young teachers, on the goals and ways of education, the application of advanced technology and teaching techniques in teaching subjects. A prominent feature of the educational science was that the reports addressed a wide range of subjects, including children with disabilities and children with attention deficit hyperactivity disorder. In summary, in addition to the richness of the topic, the reports focused on practical, enviable and interdisciplinary issues, which demonstrates the scientific content and significance of the conference. At the conference, Prof. Dr. Nguyen Van Minh – the president of HNUE gave honorary flags to the team attending the conference and the flag to Assoc. 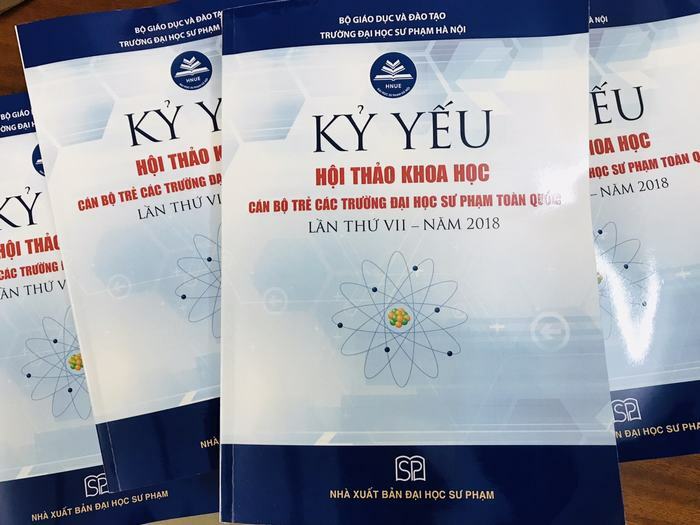 Prof. Dr. Nguyen Dinh Luyen – Vice president of Hue Pedagogical University, where the 8th scientific conference for young cadres at local pedagogical universities will take place in 2020. Prof. Dr. Nguyen Van Minh – the president of HNUE gave the flag to Assoc. 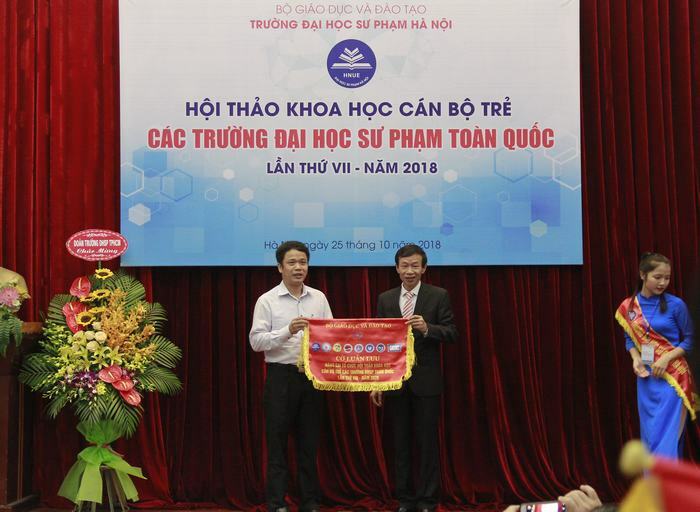 Prof. Dr. Nguyen Dinh Luyen – Vice president of Hue Pedagogical University, where the 8th scientific conference for young cadres at local pedagogical universities will take place in 2020. At the plenary session, there were 2 presentations of Assoc. Prof. Dr. Nguyen Van Bien - Vice Dean of Faculty of Physics on some research directions on STEM education, and Dr. Ngo Tuan Cuong, the coauthor of the study of luminescence silver, published in the Science journal, USA, among the top scientific journals. Dr. Ngo Tuan Cuong discussed the article "Theoretical investigation of optical absorption and emission of oligoatomic silver clusters embedded in the LTA zeolite cavity" and shared the process of publishing the reports internationally. The group came to the conclusion that the seminar had very practical subjects, including: research will have great application for computer science, refining Zr to make materials, non-classical equations, and meaningful research in species assessment and valuation. Improving the quality of human resources education and training at universities in Vietnam in the current time in the impact of the Industrial Revolution 4.0. The group came to the conclusion: The visualization of the long-term scientific roadmap is important. The group pointed out the emergence of important research groups, resulting in long-term research results that had a positive impact on the research community at universities. The research was linked to the real world, suggesting new issues in the present life, answering the questions of the present society. The group came to the conclusion: The conference is an opportunity for young researchers to exchange and learn from each other, to improve the quality of their research, especially for educational research. It is hoped that further studies will be conducted in the direction of increasing empirical research to keep pace with current trends and towards international integration. In addition to the presentations, the conference also had many opinions and experiences shared by many scientists and young cadres of the universities nationwide. This creates a variety of perspectives and knowledge and contributes to the overall success of the workshop. The conference ended at 12 a.m. According to the plan, in the afternoon, the delegates visited Temple of Literature and General Vo Nguyen Giap. The conference, as Prof. Dr. Nguyen Van Minh said, was the connection between young researchers and the future.